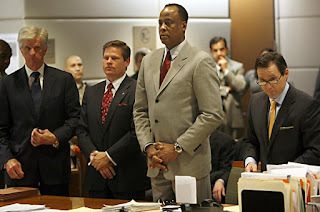 Conrad Murray, Michael Jackson's personal physician and alleged murderer, was charged with manslaughter today. Manslaughter, the unlawful killing of a fellow human being without malice or intent, carries at most a four year prison sentence. The doctor pleaded not guilty. It is widely reported that the Jackson family is outraged at this light charge. The LA Times has a nice background on Dr. Murray. He was born in Grenada and his Caribbean accident enchanted MJ. He was in financial difficulties when he was hired by Mr. Jackson. Dr. Murray is supposedly supporting six children, two of which are with his wife. The youngest of his illegitimate children was born just last March in Santa Monica. He owed $1.7 million on his country club house that is now assessed at $1.08 million. He also was in debt of $435,000 to his creditors and student loans. He is praised by his patients for excellent bedside manners. He blames his financial predicament on treating poor patients in Houston two days a month. He reportedly asked Michael for $5 million to be his personal physician during the "This Is It" concert tour. Michael insisted on having Dr. Murray accompany him to London despite urging by the tour company to use local doctors. The agreed salary was $150,000 a month. Michael had the last laugh though. He never signed Dr. Murray's employment contract. Now he is s*** up the creek and he didn't get a single dime out of this whole fiasco. That's what happens when you use a doctor who is not invested in your health but in his own wallet.